Thank you for your interest in contributing to JUNO. JUNO is published six times a year, in line with the seasons: Early Spring – 1 February, Spring – 1 April, Summer – 1 June, Late Summer – 1 August, Autumn – 1 October and Winter – 1 December. All work submitted must be written by you or the writer you represent. We do not publish articles that have been published, in whole or in part, elsewhere. Please do not submit articles that are currently pending with another publication. Although we may express interest in receiving an article, the final decision about whether it will actually be published will not be made until it has been reviewed. Once your article has been accepted for publication in JUNO, you may not submit that article, part of that article or similar content for publication elsewhere. We do not pay for content. A six month subscription (3 issues) is given as remuneration for articles. All writers also have a bio with their article where websites may be listed. All work submitted must be written by you or the writer you represent. You must be the sole copyright holder for each article you submit. By submitting material, you acknowledge that you are legally entitled to distribute the work and to allow it to be redistributed. If you are a public relations firm or book publisher with copy to distribute, please include a note to that effect at the top of the article you submit. Please contact us through this form to obtain an e-mail address for sending your work and any attachments. Articles should be Microsoft Word (or compatible) documents, the word count a maximum of 1400 words. Longer articles may occasionally be accepted Please include references and further reading where appropriate. For books please provide title, author, publisher and “out of print” if no longer available. Although we may express interest in receiving an article, the final decision about whether an article will actually be published will not be made until it has been reviewed. We reserve the right to publish or reject articles. The editor must ensure that articles reflect JUNO’s ethos. We do not publish articles that have been or may be published elsewhere, in whole or in part, unless by prior agreement. Please do not submit articles that are currently being considered for publication elsewhere. The editor will respond promptly so that, if your article is not considered appropriate, you will then be able to submit it elsewhere. We will occasionally accept advertorial articles, by prior agreement. Please send any images to accompany features. Images should be sent in TIFF format at least 300dpi resolution at A4 size. See below for credit information. We reserve the right for articles, artwork and images used in the print magazine to be published anywhere on our website, blog, syndicate through RSS or link via social media websites. We may also change where material appears, including the category, at any time. Content is planned for many issues in advance. As we receive many articles, we may ask to keep your article on hold for a future issue. Should you agree to the editor holding your article on file in this way, you may not then offer the article, part of the article or a similar article, to another publication, in print or on-line. When your feature, photographs or artwork is selected for inclusion in JUNO, the editor will inform you in which issue it will appear the editor reserves the right to alter this to achieve an appropriate editorial balance for each issue. For publication of a feature, you will receive a 3 issue subscription to the magazine. For publication of a review, small article or contribution of less than 1 full page in the print magazine, you will receive one copy of the issue featuring your piece. For publication of a feature on the website you will receive a complimentary copy of the current issue of the print magazine plus a back issue. We reserve the right to cease any subscription should the words or actions of the author bring JUNO into disrepute. We also reserve the right to take any action required to counteract any damage to the brand. Copyright will remain with the author but you may not offer the article agreed for publication in JUNO, any part of it, or any similar content, including parts of articles, to another publication, whether in print or on line. We reserve the right not to publish your article for any reason given by the editor. The article is not republished elsewhere without the express permission of the JUNO editor. Any article that is republished elsewhere credits the Issue of JUNO where it was first published, with a link if appropriate. The article is not posted on your personal blog or website until the following issue is published, and when it is posted, details of the issue of JUNO it was published in and links to the JUNO website are given. You may reference the article within that period, but a link to the JUNO website must be given. A re-written version of your article, or part of it, is not submitted elsewhere for publication, in print or online. Any verse, song lyrics, or other content not written by yourself is either public domain, or you have express right to publish this content. You have provided proper attribution to any and all other work included in your piece. In accordance with fair use, please limit direct attributions of non-public domain work to 300 words or less, or two lines of poetry or verse. You give JUNO the consent to publish your article, or any excerpt of your article, in print or online, for the duration of the magazine’s existence. You agree to indemnify JUNO Publishing Ltd from and against all claims, losses, expenses, damages and costs, including reasonable legal fees, resulting from any breach of these Terms and Conditions (including negligent or wrongful conduct). Any photographs or illustrations used are your own work, or you have gained the artist’s permission for use and have provided us with details of who to credit. The standard JUNO credit is name plus website, so please inform the editor if you require a different credit. You have permission for images of any children in the photographs to be used. Copyright for any illustrations used in JUNO, in print or on-line, will remain with the artist. Should the illustration be used anywhere else, we ask that the issue of JUNO where it was first published is prominently credited, including the name of the article it illustrated and a link to the JUNO website. Link to the article from your blog or website. Use a photo from the feature in a blog post with a link back to the JUNO website. Publish this piece on your own blog or website two months after the publication date, provided you maintain a link back to the original published piece on junomagazine.com, with the publication date and the words “Reprinted with the permission of JUNO magazine” clearly visible. Please contact us with any other requests for reprint. 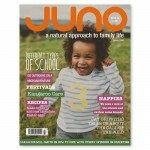 JUNO aims to enrich family life and relationships by encouraging reflection, self-acceptance and peaceful parenting, building a sense of community and celebrating the roles of parenting and homemaking, with all of the associated joys and challenges. Our ethos is based on natural parenting, environmental sustainability, social justice, nonviolence and spiritual awareness.